I have yet to see the 1979 television adaptation of John le Carré's espionage novel Tinker Tailor Soldier Spy, but despite that handicap I am fully aware that Sir Alec Guinness basically owned the role of master spy George Smiley. In fact, apart from Obi-Wan Kenobi in the Star Wars trilogy, I'm hard-pressed to find a role so identified with Guinness as much as that of Smiley. It would be daunting for any actor to try and capture a part that I figure has been done definitively. Fortunately, Gary Oldman isn't any actor: he's one of our best; therefore, I figure it won't be a smear on Guinness to see another actor take on George Smiley, and do it so well. It might be a disadvantage to have not read the le Carré novel either, but despite the talk that the plot is highly complicated I found Tinker Tailor Soldier Spy flowed rather well given that the television series was seven hours compared to the two hour film adaptation and this, I trust, will be the last time I bring up the 1979 version. Control (John Hurt) is the head of The Circus: the British spy agency MI-6. He suspects there is a mole within the highest levels of The Circus. However, after a bungled attempt to bring in a Hungarian general, he and his right-hand man, George Smiley (Oldman) are forced out. Control dies, but held to the idea that one of his top lieutenants worked for the Soviets: Percy Alleline (Toby Jones) whom he nicknamed "Tinker", Bill Haydon (Colin Firth): "Tailor", Roy Bland (Ciaran Hands): "Soldier", or Toby Esterhase (David Densick) "Poorman" (it goes without saying one of them is "Spy"). In retirement, Smiley is brought in surreptitiously by the government to find whether there is, in fact, a mole buried deep and high in The Circus. Of course, he can't just go in himself, so he gets the assistance of Peter Guillum (Benedict Cumberbatch) who works at The Circus, as his inside man. Tinker Tailor Soldier Poorman, who now run The Circus, have a faith in what the call Operation Witchcraft, where they get information from their Soviet mole. Smiley and Control have always doubted Witchcraft, but since they are no longer there the program goes on. Smiley discovers, through careful investigation, that Ricki Tarr (Tom Hardy), believed to have turned against the British, was in reality loyal and knew about the mole, while Jim Predeaux (Mark Strong), is not a turncoat either, but had been tortured by the Soviet master spy known as Karla. Karla is Smiley's nemesis, one with a history with him. Eventually, the mole is discovered, the traitor gets his just desserts and Tinker Tailor Soldier Spy ends with George Smiley brought back to Circus, as Head. Watching Tinker Tailor Soldier Spy, I never felt lost within the byzantine story, though at times Dino Jonsater's editing did make me wonder whether it was a flashback or not regarding Predeaux's character. On the contrary, Peter Straughan and the late Bridget O'Connor's screen adaptation flowed smoothly, if not perfectly. I can say that on the whole the story was not confusing or hard to follow. Another great quality in the script is in the character's ability to talk shop as it were, use the language they understand to explain things for themselves, such as highly-valuable information being "treasure". The use of The Circus' vernacular may throw some people off, but if one pays attention it won't be too difficult to follow. Anderson's directing task is an enviable one: he has a cavalcade of some of the best British actors around both established and up-and-coming. Each of the characters by and large are not emotional save for whenever a character is caught doing something he shouldn't; it should be noted that Tinker Tailor Soldier Spy is primarily a man's film with only Svetlana Khodchenkova's Irina, that woman of mystery, having any major part of the story. However, this is a plus in that we see these agents as what they really are: bureaucrats whose department in espionage. Of chief attention is Oldman. Oldman's Smiley doesn't really take action as he does react to everything, and he does so with a calmness and steadiness of someone who is an old hand at his job. I can only recall once when Smiley was anywhere close to explosive though now I can't recall at exactly what point this happens. Oldman does, however, give a brilliant performance throughout Tinker Tailor Soldier Spy, in particular when he remembers his one encounter with the Soviet agent who would become his archenemy, Karla. It's just him, talking about their encounter, but Oldman holds your attention throughout the scene that it becomes almost intimate, or as close to intimate as Smiley will ever get. I would argue that Cumberbatch as Guillum has a smaller role, but not without him creating moments of tension and even sadness. I would argue that this particular strain in the story is one of the few flaws within Tinker Tailor Soldier Spy. Without it being too overt, the understanding of what is going on is that for his own safety, Guillum has had to send his boyfriend away. It is never made explicit that Guillum was gay though that's the conclusion one draws from what one is shown. Guillum's sexual orientation, which I understand was changed from the original novel from hetero to homosexual doesn't add much or appear to be altogether relevant to the overall story. The actual members of The Circus are so brilliant that it becomes fascinating to watch all these actors, highly talented, show their skills, from the amorality of Firth's Haydon to the stubbornness of Jones' Alleline and the fear of Densick's Esterhause. We don't have long backstories about them or really know which one is the actual Spy until the end, always a plus to have us figure it out, even though the traitor appears to be a logical choice. Among the finer technical aspects are Alberto Iglesias' dark and tense score and Hoyte van Hoytema's cinematography, capturing the dark and moody nature of the story with its gray skies and dark rooms. 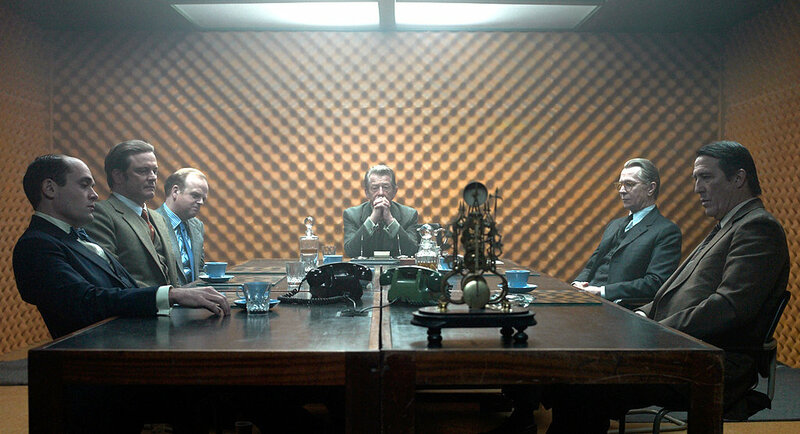 I'd also throw in the excellent 70's-style costuming of Jacqueline Durran and the set designs of Tom Brown and Zsuzsa Kismarty-Lechner (the main control room where Control operates is one of the few openly bright rooms in Tinker Tailor Soldier Spy, serving as excellent counterpoint to the darkness all around it). Granted, Tinker Tailor Soldier Spy may be a bit opaque in terms of story, plot points, and look, but on the whole this is not a hindrance to the film. The film is so good that even the tiny hint of a suggestion that there may be a sequel when Smiley returns to sit at the head of the table doesn't bother me. In fact, I wouldn't mind seeing another film of a George Smiley story. 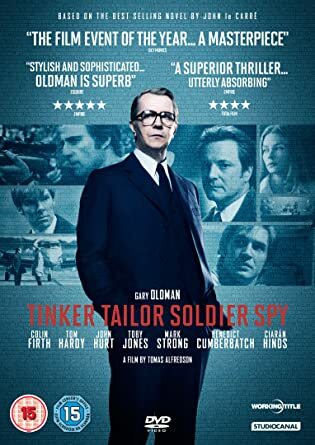 Tinker Tailor Soldier Spy is complex, but not complicated, well-acted (if a bit too self-seriously so) and highly intelligent. It's a great Circus act.